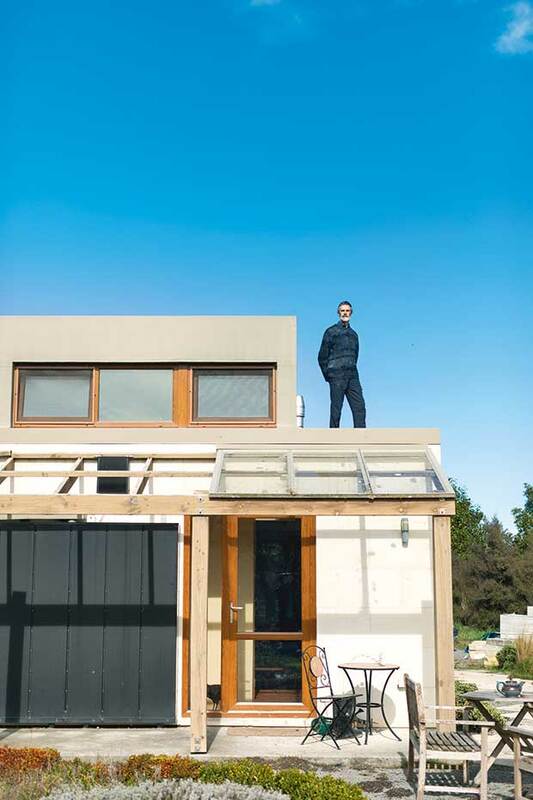 This award-winning Geraldine home may be 10 years old, but it’s still way ahead of the average NZ house. When they built their smart house back in 2008, they knew they’d have no need for art on the walls. 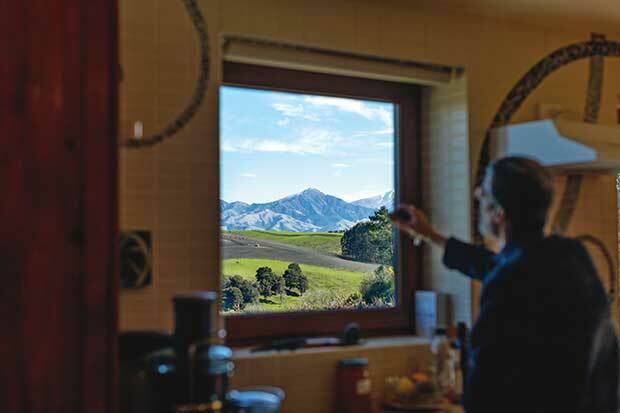 Instead, carefully placed windows ensure the spectacular views of the majestic Four Peaks Range are framed to perfection for anyone working in the kitchen or sitting in the lounge. They bought the land in 2003. That gave them time to make observations about the land. The house sits at the end of a long driveway, on a platform cut two metres deep into a west-facing, clay hillside. “Fortunately, we didn’t hit rock, because there is volcanic rock further down,” says Rhys. There is parking on the southern side of the house. The retaining wall that forms one side of the couple’s home extends around the garden, forming a sheltered courtyard. 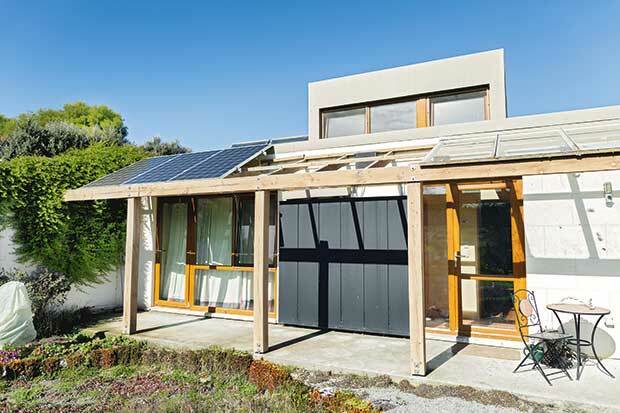 Christchurch architect Roger Buck was considered a leader in energy-efficient, sustainable builds, most using large amounts of concrete to create thermal mass. He was renowned for creating homes that were pleasant to live in. “We went to visit some houses of his clients and we found that the interior environment was wonderful,” says Rhys. “They obviously had very stable temperatures and we saw some of them on very hot days and they were cool inside. “The owners of those houses praised the experience of living in them. For example, no condensation, no cold spots. The view from the green roof, with a hint of the Four Peaks Range through the clouds. The ex-pat UK couple have no children and no family who may need to live with them. That meant they could save a lot of money building a house just for themselves. Rhys says the long-term performance of the house was also an important aspect of the build. The wood burner is the smallest clean-burning option you can buy, and only needs to run for two hours a night during winter. The bonus is that Roger Buck’s design is also seismically strong. Even the concrete in this home is smarter than average. It contains a high proportion of fly ash, a by-product of steel-making. A concrete retaining wall holds back the hillside, and forms the eastern wall of the house. The north-facing front of the house is mostly windows, with a solar air heater. The exterior is Oamaru stone, with an air cavity behind it for ventilation, as it’s slightly permeable. Behind that is a layer of extruded polystyrene insulation. The couple did not want to use MDF in their cabinetry, to avoid volatile gas emissions. Binders and resins in MDF can give off carcinogenic formaldehyde gas for years. They also didn’t use – to their knowledge, says Rhys – any polyurethane sealer. The floor is covered with terracotta tiles. Natural products were important to Anne and Rhys, to avoid volatile gas emissions. 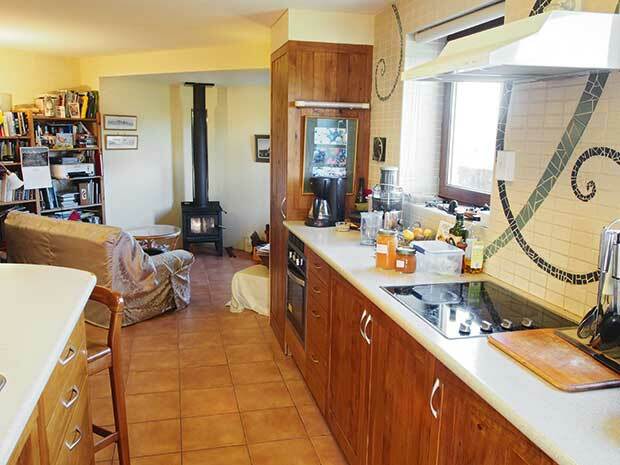 The house has terracotta tiles on the floor, and a kitchen made from rimu and macrocarpa. One of the picture windows, framing the Four Peaks Range. The couple’s tilt-and-turn windows are of German design. Turn the handle horizontal and they open sideways, for easy cleaning. Turn the handle up and they tilt open from the top, for ventilation and security. uPVC has the highest insulation value of any window framing you can use, with very little heat loss and no condensation. 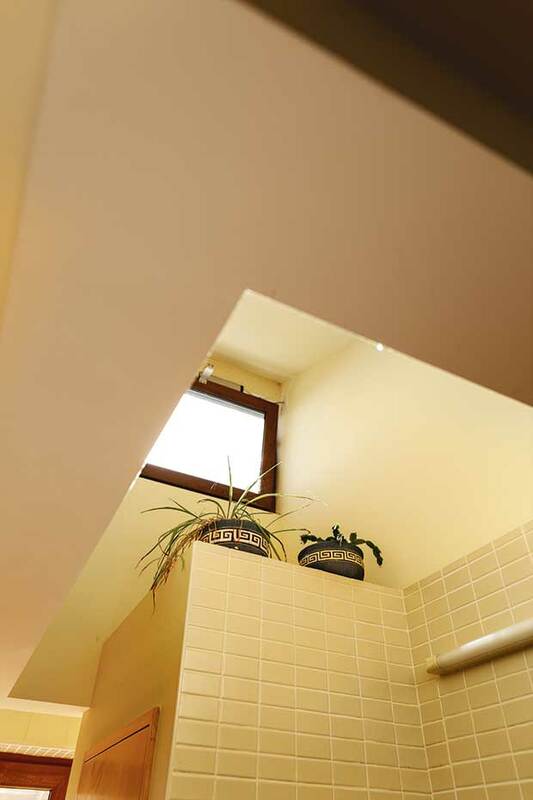 The clerestory window in the bathroom helps to ventilate moisture out of the house. An important design factor is the lack of windows in the house, to help maintain warmth in winter, and keep it cool in summer. 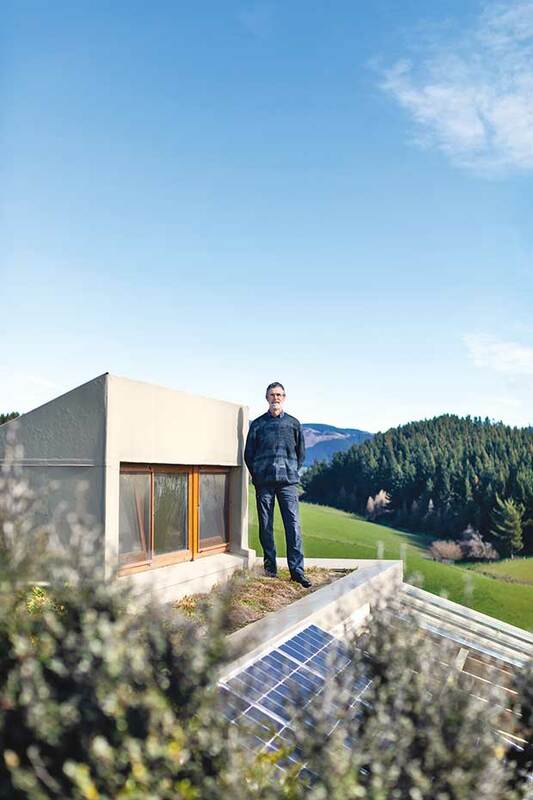 “Very big footprint houses have loads of picture windows and they’re completely thermally inefficient,” says Rhys. “They overheat (the house) in summer and are too cold in winter. 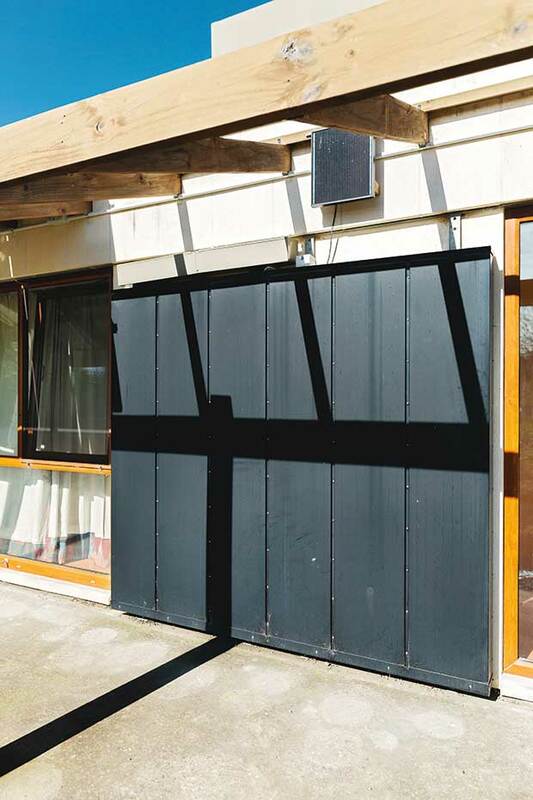 The solar air box sits on the north-facing wall of the house, generating hot air that is 20°C warmer than outside. It is blown into the coldest part of the house by a fan, warming it, and also helping with ventilation. The fan is turned off in summer. Rhys says thanks to their home’s high thermal mass, which absorbs large amounts of heat during the day, they only need a small wood-burning stove to heat their home. Another important heating system started as an experiment. At the front of the house is a large, black, square, flat box fitted to the wall. It has very small, regular-sized holes in it, and a vent at the top. In winter, a small, 12-volt, solar-powered fan pulls hot air out of the black box and blows it into the coldest part of the house. Rhys says the system is very effective. This air helps to warm and ventilate the house. Any moisture, from bathroom steam or cooking, is picked up by the warm air and ventilated out the pop-up clerestory window on the roof (pictured below). This type of window has been used by architects since ancient Egyptian times to allow more light into a building. However, on the sunny side of an energy-efficient house, they can also play a big part in ventilating air, passively heating or cooling a house. It’s known as a solar stack. “The clerestory windows face north and let beautiful light into the house,” says Rhys. “But more interesting, in winter, on a sunny day, we have those windows open all the time. 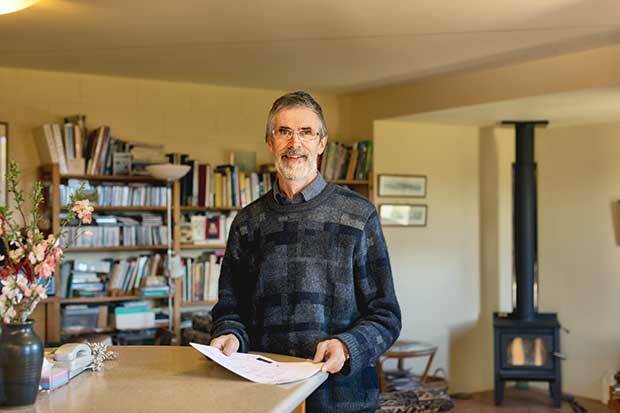 Years of living in cold rental properties and his experience in sustainable building has shown Rhys that New Zealanders don’t fully understand the concept of heating and ventilation. Warm air carries a lot of moisture. 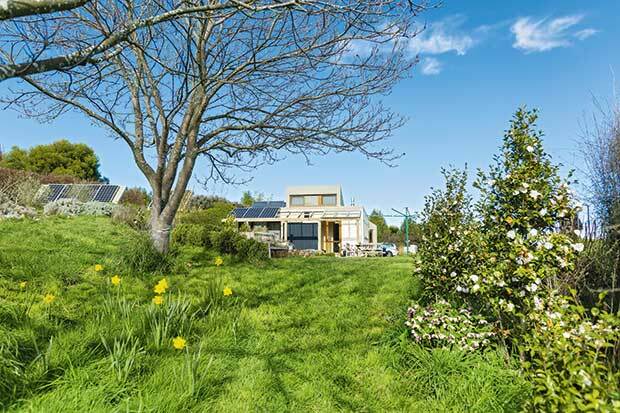 Most people don’t think of their neighbours when they build a house, but Anne and Rhys wanted to preserve the unspoilt views of the stunning mountain range for the people living next door. The roof is level with the hillside, meaning it’s easy for Rhys to access it. A concrete block retaining wall on the east side is also the exterior wall of the house, providing an almost seamless transition from the hillside to the roof. The roof is made of concrete panels, covered with a layer of poured concrete. There are layers of insulation, a butynol waterproof membrane, geotextile mats as root barriers, a layer of shingle, and a thin layer of soil (about a hand-span deep). Drains between the hill and the roof channel storm water into a storage tank. 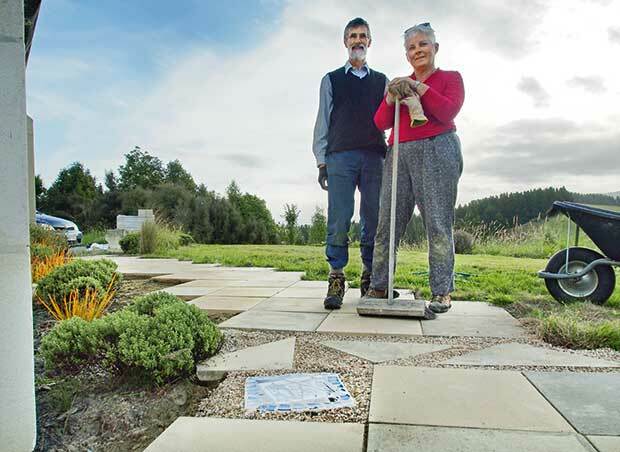 The couple weeded the roof religiously for the first 18 months to preserve their plantings. 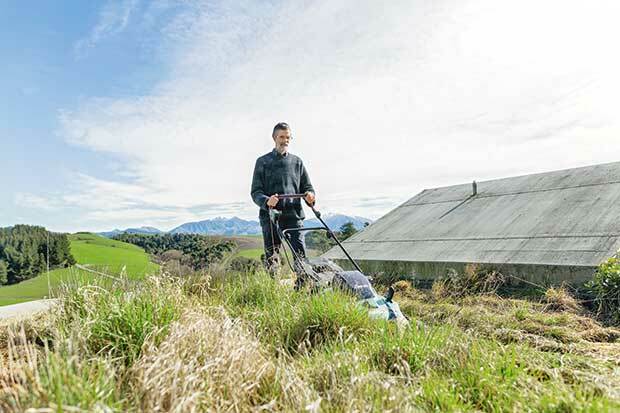 Today, Rhys uses the mower. Their roof ‘meadow is mowed once a year. The original plantings were a mix of native grasses and groundcovers. Even the underfloor heating in the bathroom is powered by solar. It’s on a timer, meaning Anne and Rhys wake up to a warm floor. 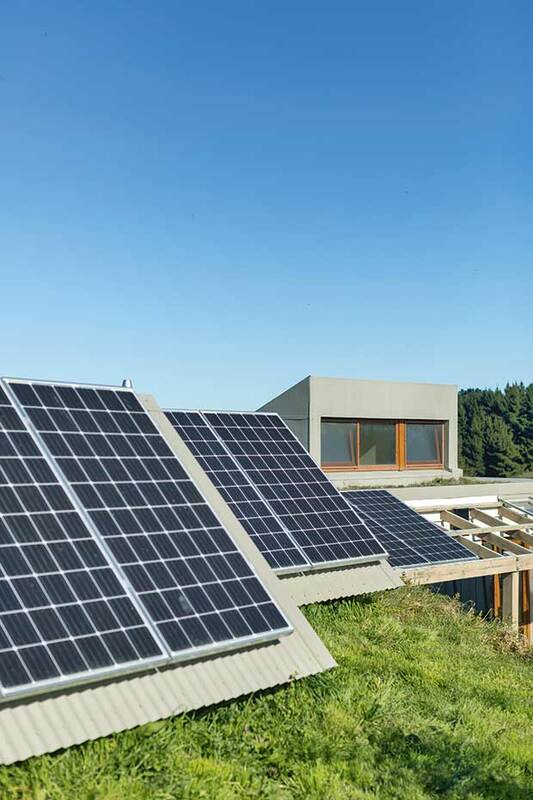 In the morning, the solar panels power appliances like the washing machine and dishwasher. In the afternoon, it helps to heat the couple’s hot water supply and recharge Rhys’s laptop. The house is still on the grid because the couple don’t have batteries. They buy in power when it’s dark, but all the efficiencies in their home mean even in the middle of a cold, dark winter, their worst power bill was just $113. Their array of nine solar PV panels all face north, but are at different angles: 25 degrees off horizontal on the veranda (summer-optimised); 45 degrees (winter-optimised) on the two woodsheds. The wood sheds doubling as frames for the solar panels had great appeal to Rhys. 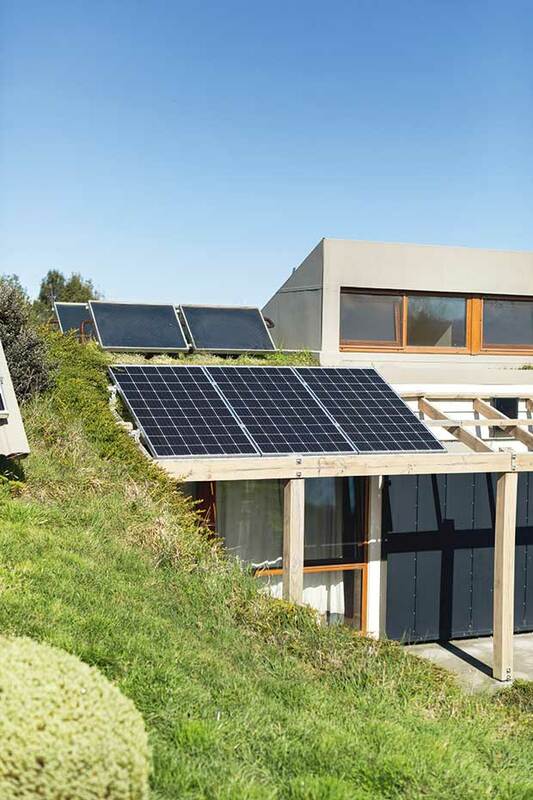 The solar system includes panels (on the porch pergola) which power the house during the day. 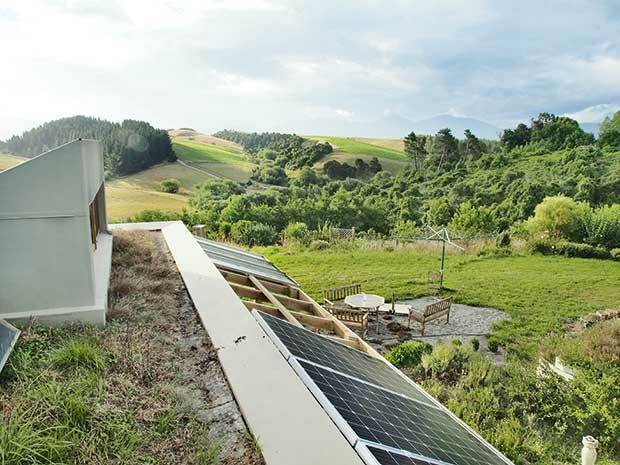 Solar thermal panels sit above the hot water cylinder. These preheat the water to 40-50°C. 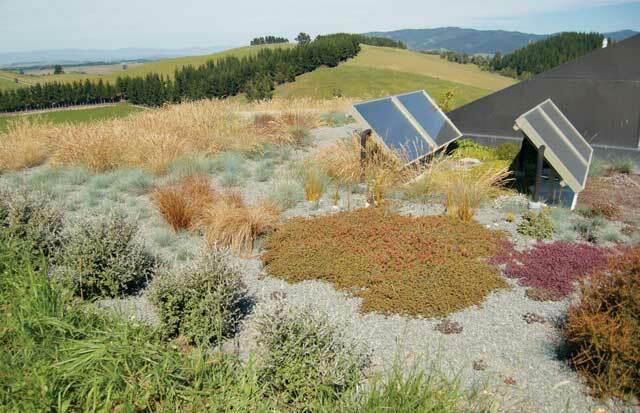 A solar water heating system pre-heats their water to 40°C, sometimes up to 50°C – “if we’re lucky”. A sealed, glycol-filled pipe is heated by a series of panels on the roof. It runs down into the hot water cylinder, transferring heat, then back to the panels. The hot water cylinder’s top section is heated up to 60°C each afternoon by power from the PV panels, controlled by timer. Anne and Rhys are planning an extension to their house (see page 36). Adding extra solar panels and microinverters to its roof would turn them into power exporters. Would solar work on your block? To get the best from solar panels, it’s important to orientate panels to solar north and at a slope angle close to your latitude. The free-to-use Solarview calculator from NIWA helps you to work that out, using your location. It shows the differences between summer and winter potential generation in kWh/sq metre per day. The cool temperature larder is on the colder, southern side of house. Anne and Rhys are enthusiastic preservers, storing fresh, long-keeping fruits, and bottled fruit, juices, jams, chutneys, and root vegetables. 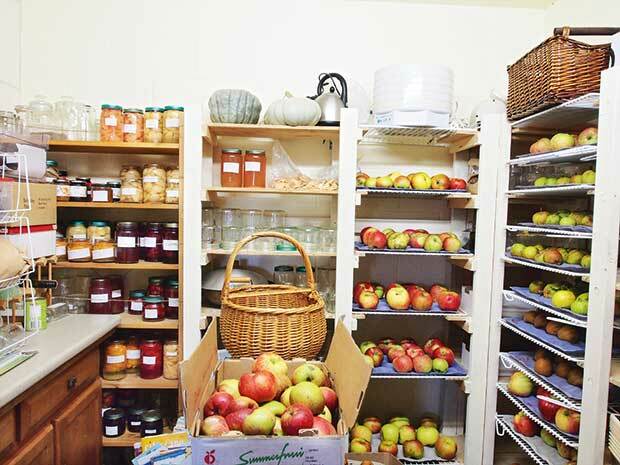 They also use the larder to store bulk groceries and the occasional wine or beer bottle. The temperature in the larder is, on average, 6°C colder than in the main part of the house, providing good conditions for food storage. A house with a small footprint is important, but over the years, Rhys and Anne have had an increasing number of visitors. They are now building a small extension to house a guest bedroom, an office, and a food processing area so they can preserve large amounts of food without having to cram it all into their home kitchen. An important rule of passive solar homes is to keep windows to a minimum, with most glazing on the northern side. When Anne and Rhys built the house, they included a triple bi-fold window on the south-west side to take in the views. “It overheated us in the summer,” says Rhys. 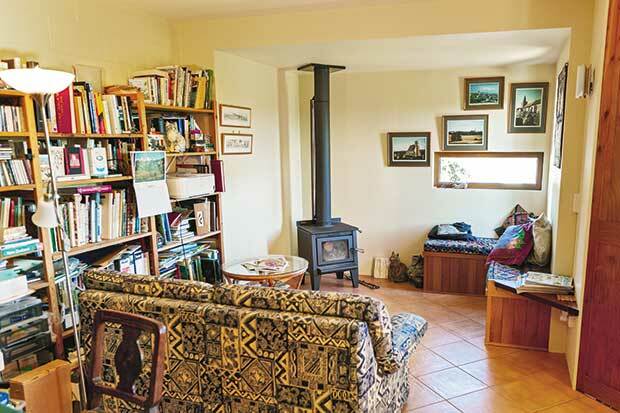 “We took out that window and extended our lounge out by 2m which gave us space for the wood stove. “On summer afternoons, when the sun is low but still very powerful, we just took in more heat because having a structure like this, all the heat that shines in gets soaked up… and we overheated in summer. We installed small windows instead and now it works very well. The couple are very proud of their roof, but Rhys says it was a big expense. Rhys is the national co-ordinator of the Sustainable Living Education Trust which runs the Future Living Skills community education programme. Its courses cover aspects of sustainability, including eco building, energy efficiency, water use and river protection, growing organic vegetables, waste minimisation, healthy food choices, travel options and carbon impacts, and community resilience. So far, 14 different councils are members of the trust, and if yours is one of them, you can download the resources for free. If not, you can subscribe for a fee.